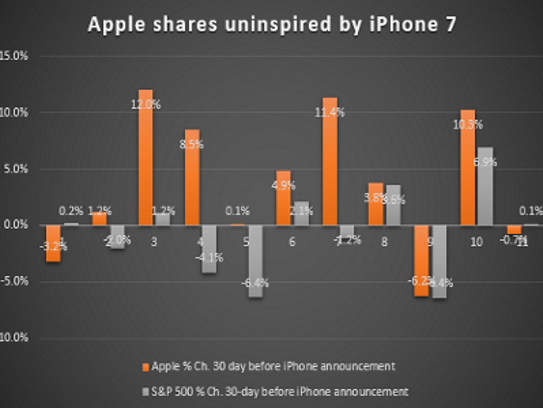 Diehard Apple (AAPL) fans are fretting over what will go missing in the newest iPhone. But investors are more worried about something other than an absent headphone jack: The missing enthusiasm for Apple’s stock. Shares of Apple are down 0.7% in the 30 days leading up to the 11th iPhone product launch expected Wednesday, lagging the Standard & Poor’s 500 index 0.1% increase during the same time. The lackluster stock reaction coming into the smartphone announcement is a departure from previous Apple smartphone launches going back to the original iPhone almost a decade ago. On average, Apple shares have gained 3.8% in the month prior to an announcement. The last iPhone, the shrunken-down and discounted SE, certainly sparked more interest, gaining 10.3% in the 30 days prior to the March 2016 announcement as the S&P 500 rose 6.9%. The lack of excitement is notable given the importance of the product to Apple; iPhone revenue accounted for two-thirds of Apple’s revenue last year, according to market research firm Trefis. All this shows investors, despite media hoopla, aren’t looking for much from the iPhone 7, says UBS analyst Steven Milunovich in a note to clients. “Investors already anticipate underwhelming iPhone 7 features,” Milunovich says. The lackluster run of the stock ahead of the new smartphone announcement is even more disappointing since the stock typically runs into pressure afterwards. Apple’s stock has declined an average of 0.6% in the 30 days after the previous iPhone announcements going back to 2007. In the last four cycles, shares of Apple fell 4% in the two weeks after new phones were actually launched and made available, Milunovich says. The smartphone is a mature product and the company’s other offerings ranging from watches to tablet computers as well as music and payment services have failed to pick up the slack. Apple’s revenue is expected to fall 8% this fiscal year ended in September to $215.4 billion, says S&P Global Market Intelligence. Even with a new smartphone launch, next fiscal year, analysts see revenue inching up just 4%, a fraction of its 28% revenue growth in fiscal 2015 and 31% average revenue growth over the past five fiscal years.